The image grid below shows specimens that were injected with ³H-thymidine on four consecutive days: birth (P0), P1, P2, and P3. One specimen survived to P10 (left column), another to P20 (middle column), and another to P40 (right column). These specimens are representative of others in their respective age groups. All images are of sagittal sections from the most medial (Level 1, row 1) to far lateral (Level 12, row 12). 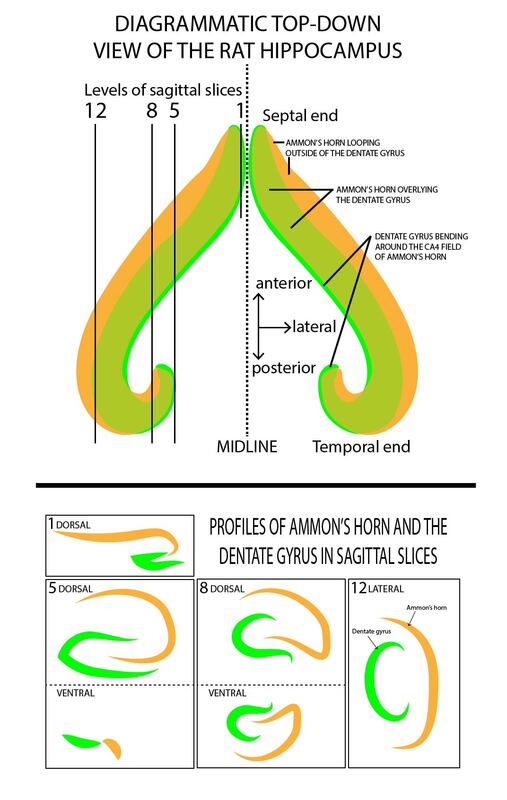 The diagram to the right is my attempt to explain how the interlocked pyramidal layer (orange) in Ammon’s horn and the granular layer (green) in the dentate gyrus appear in the various cuts through the hippocampus (Ammon’s horn and the dentate gyrus). The top drawing shows how the hippocampus extends in a curved pattern around the thalamus, from just posterior to the septum (septal end), extending laterally and downward into the cortical temporal lobe (temporal end). Note that Levels 1 – 4 only cut through the dorsal hippocampus overlying the thalamus; Levels 5 – 7 cut the dorsal and ventral parts of the hippocampus in separate parts of the slices; Levels 8-12 show the merged parts of the lateral hippocampus. Prenatal granule cells are the “pioneers” that outline the superficial limits of the granular layer. The external limb of the granular layer has a more robust representation of prenatal granule cells than the internal limb. The septal and temporal ends of the granular layer are almost completely composed of prenatal granule cells. What these images show is that the prenatal population of granule cells may have different properties from the postnatal population. Their generation and positioning may play a critical role in shaping the mature dentate gyrus as it characteristically wraps around the CA4 field of Ammon’s horn pyramidal layer. Click on the link below to download a pdf file of the illustration on the right.